On the itinerary you’ll have a chance to explore Kathmandu, fly over Lukla, ascend to Namche Bazaar, sleep in traditional tea houses, visit the Thyangboche monastery, ascend Nangkartshang and Chukkung Ri, and spend time at Everest Base Camp. Enquire today to save your spot! The group flights usually arrive into Kathmandu in the afternoon - those travelling on them will be met at the airport and transferred to our hotel. The rest of the group will join us at the hotel throughout the afternoon. There will be a full briefing this evening. *Hotel Manaslu / Ambassador* (or similar). We fly to the mountain airstrip of Lukla (2,800m), and head northwards up the valley of the Dudh Kosi (or 'milk river'). We descend from the small plateau, down into the forested valley. The trail crosses several tributary streams and we have some tantalising views before reaching the small settlement of Phakding (2,650m), where we will spend our first night. *Teahouse (sleeping altitude 2,652m)*. Heading out of Phakding we follow the Dudh Kosi northwards. This day's walk takes us through magnificent forests with glimpses of the mountains ahead. We cross the river several times by bridges as we pass through the villages of Benkar, Monzo and Jorsale. A final bridge brings us to the foot of the steep climb to Namche. Halfway up this ascent we may get our first glimpse, cloud-permitting, of the summit of Everest appearing majestically behind the great ridge of Nuptse-Lhotse. A last 300m of climbing brings us to Namche Bazaar, the Sherpa capital and the main town in the area. Namche is a prosperous Sherpa town and an important trading centre. It has a weekly market on Friday afternoon and Saturday morning but the town bustle all day every day with trekkers, coffee shops, bakeries and stores selling all kinds of trekking and climbing gear as well as Tibetan souvenirs. *Teahouse (sleeping altitude 3,440m)*. We climb steeply out of Namche past the airstrip at Shyangboche, to the Everest View Hotel, the highpoint of our day at 3,880m. Built by the Japanese this spectacularly situated hotel with wonderful views of Everest and Ama Dablam is an ideal place for a tea break. Descending through forest we come to Khumjung, where we have lunch close to the Sir Edmund Hillary School. After lunch, we walk up to Kunde and visit the Edmund Hillary Hospital. The twin villages of Kunde and Khumjung are set below Khumbila, the rocky peak sacred to all Sherpas. For much of the walk, we have great views of Ama Dablam and other Himalayan giants. We walk back down through Khumjumg, to the monastery. Sadly it was damaged in the earthquake but is now being repaired. Inside is a small box and after paying the entry fee (which goes towards the repairs) we will be shown the only Yeti skull in the world! Descending to the main trail we spend the night at Kyanjuma (3,600m). *Teahouse (sleeping altitude 3,600m)*. This morning we descend to the river; we cross it at the little settlement of Phunki Thangkha at 3,250m, then climb steeply through the forest to Thyangboche at 3,867m. We will be here by lunchtime and in the afternoon, we will visit the famous monastery. The sunset and sunrise on the fantastic panorama of mountains surrounding us are not to be missed - Everest, Nuptse, Lhotse and Ama Dablam provide a wonderful backdrop to our teahouse. Look out for Himalayan Tahr in the forest surrounding the monastery. *Teahouse (sleeping altitude 3,867m)*. The trail from Thyangboche leads downhill through a forest of conifers, birch and rhododendrons. The trail passes the nunnery at Deboche to cross a bridge over the Imja Khola, whose valley we now follow. The trail then enters Pangboche, at 3,900m, the highest permanent settlement in this valley. We are above the tree line now. A short climb brings us to Shomore, where we have lunch. After lunch we continue climbing to Dingboche, at 4,530m. Dingboche is a summer settlement and here the great peaks of Ama Dablam, the ridge of Nuptse-Lhotse, Tawoche and Chalotse surround us. *Teahouse (sleeping altitude 4,350m)*. We spend this day at Dingboche to continue our acclimatisation. 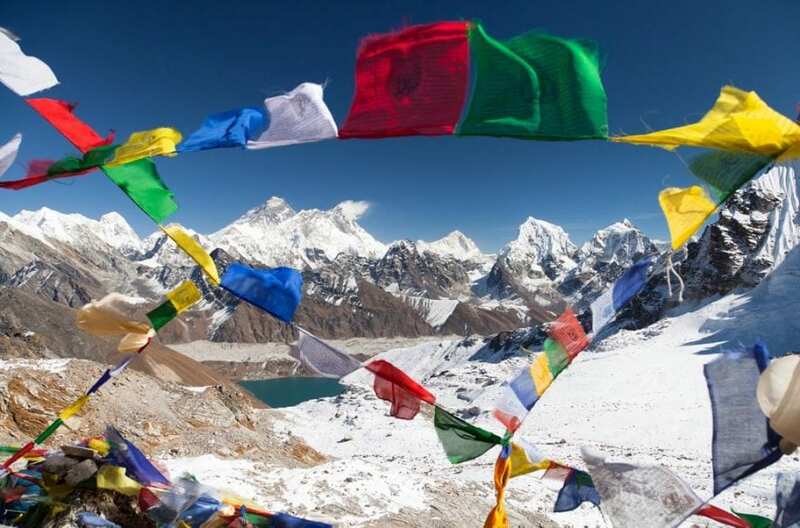 Those who are adapting well to the altitude can climb Nangkartshang Peak at 5,100m. From this hill the views are even more spectacular - Chalotse and Tawoche tower above us, Ama Dablam rears up across the valley and in the distance, we can see Makalu. *Teahouse (sleeping altitude 4,350m)*. The trail ascends the valley gently towards Island Peak and Chhukung, a small settlement at 4,730m. From Chhukung we will ascend Chhukung Ri (5,546m) and from here we can look directly across the valley to the fantastic snow and ice formations on Ama Dablam and the Amphu Labsa. *Teahouse (sleeping altitude 4,730m). *Trek Profile: 5.5km/3hrs to Chhukung, + 4km/3.5 hrs Chhukung Ri. An early start for a tough and very long day as we cross our first pass. We turn away from the main valley and head up a side valley towards the Kongma La. As we ascend the scenery becomes increasingly spectacular as the ridge of Nuptse appears above us. We can see the glaciers of Kongmatse ahead and the rocky peak of Pokalde is to our left. Finally, we reach a small lake before the last steep scramble to the top of the pass. From the top (5,535m), we are surrounded by peaks and glaciers in all directions. The descent is long and steep and finally brings us to the Khumbu Glacier, a real sting in the tail as we must cross it at the end of the day to reach Lobuje (4,930m) a tiny yak pasture with a few teahouses in the summer. The sunset on Nuptse towering above us is not to be missed. *Teahouse (sleeping **altitude 4,930m )*. Another long day so we start very early, following the Khumbu Glacier northwards to Gorak Shep (5,180m). The trail undulates by the side of the Khumbu Glacier on the rocky moraine. It will take us approx. 3hrs to reach Gorak Shep, where we have a rest and something to eat. We stock up on snacks and water as there are no tea houses from here to Base Camp. Leaving Gorak Shep we trek across the sandy flat at Gorak Shep and climb onto the lateral moraine of the Khumbu Glacier. The trail ascends the side of the glacier for a couple of hours before descending onto the rocky glacial moraine itself. The trail winds up and down through fascinating ice seracs to the area known as Everest Base Camp (5,364m), where in spring, we may see some of the expedition teams as they prepare to summit the mountain. From the Base Camp we get fantastic close-up views of the Khumbu Ice Fall. Nuptse towers above us and Pumori rears up behind us. We retrace our steps to Gorak Shep. *Teahouse (sleeping altitude 5,180m)*. This morning we climb steeply above Gorak Shep to the small peak of Kala Pattar, 'Black Rock', at 5,545m, from where we can look down over the camps of the various Everest expeditions. This climb affords a most magnificent view of the Khumbu Glacier and above all a close-up view of the world's highest mountain. We return to Gorak Shep and retrace our steps to Lobuje. (Please note that due to bad weather we may change the order in which we do the walks to Everest Base Camp and Kala Pattar). *Teahouse (sleeping altitude 4,930m)*. Following the terminal moraine of the Khumbu Glacier we head down the valley before turning off above the Chola Tso Lake towards our next pass, the Cho La. Above us are the twin peaks of Tawoche and Chalotse. We stay tonight in the small basic tea house at Dzongla (4,840m). For the energetic there will be a chance en route to ascend Awi Peak (5,245m), a little-known viewpoint but well worth the effort for the views across to Everest Base Camp. *Teahouse (sleeping altitude 4,840m). *Walk profile: 6km/4 hrs to Dzongla, + optional 4km/3-4 hrs Awi Peak. We descend to meet the trail from the Nangpa La, which leads into Tibet, and we may well meet Tibetan traders, with their caravans of yaks laden with carpets, salt and hides. Following the Bhote Kosi Valley we head south to Thame with its spectacular monastery. From Thame we follow the valley down to Namche. *Teahouse (sleeping altitude 3,440m)*. We fly back to Kathmandu and spend the rest of the day at leisure. *Hotel Manaslu / Ambassador* (or similar). Today is free in Kathmandu for last minute sightseeing or shopping. *Hotel Manaslu / Ambassador* (or similar).